One of the most frequent thoughts people have leading up to a move is “I didn’t realize I had this much stuff.” Which makes this a good time to figure out what items need to come with you and what can stay behind. But instead of hauling everything you don’t want out to the curb, you might be able make a little money and lighten your load by holding a garage sale. Hilldrup.com offers a detailed step-by-step plan for organizing a garage sale, but we thought we’d cover some of the highlights here to give you a good idea whether a garage sale is a smart choice for you – even if you aren’t moving in the near future. Items should be priced according to their worth to consumers, not the seller. For items in good working order, charge about 20 - 30 percent of the original purchase price. Used clothing and books generally fetch lower prices. Place a price tag on each article, and list the prices on a record sheet. For convenience and to avoid lost tags, use the press-on tags available at stationary and office supply stores. Small pieces of masking tape will also work. Run an ad in your local newspaper. Insert a notice in your church newsletter or school bulletin. Distribute announcements throughout the neighborhood. 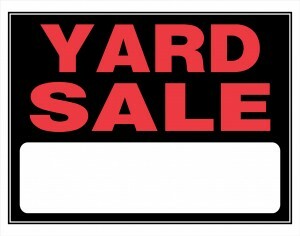 Put up signs in the area a few days before your garage sale. Have a BIG sign at the sale site. Don’t be surprised if you have shoppers arriving the night before the sale just to look around, or who arrive an hour before your posted start time. Before arranging your wares, remove from the sales area everything you don’t want to sell. Cover with a sheet or drop cloth heavy items that can’t be moved and attach a big “NOT FOR SALE” signs to them. If possible, provide a convenient electrical outlet or extension cord for testing appliances. It’s also a good idea to have a tape measure on hand so shoppers can measure furniture to see if it will fit in their vehicle or a particular spot in their home. Be sure to have plenty of change, including dollar bills, and pick up coin rolls at the bank before the big day. Lastly, life will be a lot easier if you have a firm CASH ONLY policy, with a big sign stating so. Reduce prices near the end of the sale. Remember, a cash profit, however small, is better than winding up with many leftovers.